Here you go, another episode of Man Of The Hour, just like you ordered. This week, we’re introduced to a (shortlived) new, mature Patrick and given a history lesson on Mike Posner. 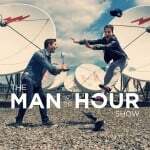 It’s Thursday once again, and that means it’s time for another Man Of The Hour podcast! Tune in this week as the guys bring up the clapping glove once again, and give their opinions on Apple’s concert copyright. It’s the second episode of MOTH’s twentieth season, and Pat and Seb are back to chat about everything from the inability to lie to Pat’s favorite contacts. Get ready, because it’s time to dive into the twentieth season of Man Of The Hour! Pat and Seb are back again, and they’re so excited about their return it can only be described as ecstasy (their words, not ours).